How To Make An Author’s Heart Go Tha-Thump! 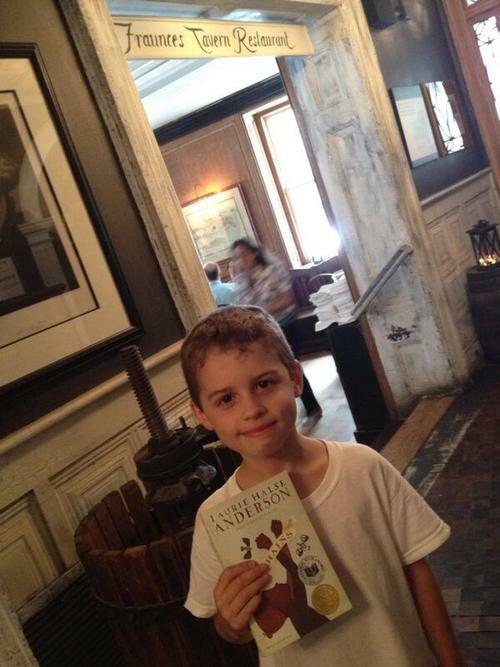 Not only did her son read and enjoy the book, but he wanted to take that experience to the next level and walk in the footsteps of the characters. AMAAAAAAZING! I suggested that they visit the African Burial Ground National Monument, which shows visitors about the lives of enslaved and free black New Yorkers and their connections to African culture, and the Fraunces Tavern Museum, which is filled with artifacts and information about New York City during the American Revolution. Not only did they go and have a wonderful time, but the Mom kindly posted this photo (reproduced with her permission) of her young history buff. What a wonderful experience for you the author, the reader and the mom. Keep up the good work, Laurie. I'm disappointed in myself for not thinking of contacting you when I went to NYC in the spring. Thanks to both of you for sharing this great photo! What a wonderful job that mother is doing creating a lifelong reader and learner. _Chains_ is a tremendous book. Thank you for all of your wonderful books. Ms. Anderson! Previous PostPrevious SPEAK is coming to Brazil!